If you are anything like me then you view dubious, highly subjective "very best of." packages as inevitable evils of the modern, consumer-ruled world that are going to exist no matter what we think of them. There are various reasons for someone to own such an abbreviation of artistry: Take my wife (please) for example. She's the type who'll buy the "Greatest Hits" of say, the Little River Band, solely for one single cut that she couldn't get enough of back in her carefree disco days and will play that particular song ad nauseum for days on end until she finally grows weary of it and sticks it in the X file (to my relief). Others have found themselves in ownership of a gift certificate to some egregious retail barn that offers nothing a simple man is inclined to purchase but happens to have a laughable CD inventory that caters mostly to rap, classic rock, C&W enthusiasts and/or those seeking the latest offering by the reigning American Idol cardboard cutout. In other words, proggers are S.O.L. in those places. However, the gift certificate scenario is why I have in my possession several "Best of." dealies that I rarely spin through my changer, but since one of those is Todd Rundgren's I might as well share my opinion of it. It's a dirty job but someone's gotta do it, right? At least it goes in chronological order which allows one to observe this gifted artist's evolution starting with the catchy 1970 Top 20 hit, "We Gotta Get You A Woman," from Todd's charming and underappreciated debut. The tepid "Be Nice to Me" follows but it merely demonstrates the boring, cream puff content of the bulk of his weak sophomore effort. "I Saw The Light," "Hello, It's Me" and "Couldn't I Just Tell You" are a trio of familiar tunes culled from his highly successful "Something/Anything" album in which he played and sang every note (with the exception of "Hello, It's Me.") "Just One Victory" is the first of a series of songs that come from his more progressive-leaning projects and it is a great mixture of all the things Rundgren had learned and mastered on his first three solo LPs and his embryonic work with Nazz. "A Dream Goes On Forever" displays his broad use of unconventional keyboard sounds, a bold and courageous undertaking that bucked the trends of that era and made him sort of a rebel. "Real Man" is a well-written tune containing a serious message where the swirling synthesizers and overall trippy production gives the number an almost psychedelic aura. "Love of the Common Man" is an acoustic-driven song with a lighter feel but the ringing, multi-tracked guitar melodies that appear halfway through keep the cut from being predictable. Todd's band Utopia is well represented on this disc, giving you a taste of what that important side project was about. "Love is the Answer" isn't their finest moment, however, as it's a bit schmaltzy in a "We Are the World" kind of way and doesn't impress. The rockin' "Love in Action" is a much better piece of music (despite its dated new wave/punk flavor) mainly due to its interesting chord progression and its intelligent, dynamic arrangement. Todd took a break at this point in his career to play and sing everything again on the "Hermit of Mink Hollow" album and the result was the pop hit "Can We Still Be Friends." It really is a fine song with some very proggish vocals and clever time signature manipulations. Another Utopia sample is next. "The Very Last Time" possesses a driving groove and a bevy of top-notch "kiss off" lyrics for those special occasions when they're warranted and welcome. One of the more attractive qualities of compilations like these is the fact that they're usually relatively cheap and, therefore, they offer an inexpensive aural gander into the artistic universe of an icon you know little about. 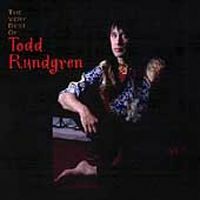 In that role this mixture of songs is satisfactory enough to avoid misleading the listener completely but, like all others of this ilk, it fails to reveal the broader scope of Todd Rundgren's considerable talents. To discover that entails investing your moola in several of his more heralded albums but the cost will be worthwhile in the long run. He really is one-of-a-kind.